Bobby the puppy snuggles up with his new feline family (left), while Ginger Rogers the dog dances her way to a forever home (right). An unlikely friendship. A mutual rescue. An unbreakable bond. The stories of these 10 lucky pets are sure to tug on your heartstrings. When Eric O'Grey remembers his shelter dog Peety he wonders, "Who rescued whom?" In 2010, O'Grey weighed 340 pounds and struggled with high blood pressure, cholesterol and Type 2 diabetes. His doctor told him if his lifestyle didn't change, he would be dead within five years. O'Grey went to the Humane Society in Silicon Valley and asked for "an obese, middle-aged dog so that [O'Grey] would have something in common with him," he said in a video published by SFGate. The two formed an inseparable bond. They took long walks together every day — 'Grey lost 140 pounds and Peety dropped 25. It wasn't long before O'Grey finished his first marathon. Sadly, Peety developed a large cancerous growth on his spleen and died. O'Grey will never forget the way Peety changed his life — and hopes to return the favor with his new shelter pup, Jake. Estella, a 2-year-old guinea pig from California, was found last fall in a carrying case on the side of the road, unable to move the lower half of her body. She was brought to the Harvest Home Sanctuary in San Francisco, where volunteers realized a child must have squeezed her tight enough to break her back, according to the animal rescue organization. After quickly raising $500 on social media, the Harvest Home Sanctuary was able to fit Stella with a tiny wheelchair, making the little guinea pig ready to roll. A lonely puppy found his new family and now has five brothers and sisters — they all just happen to be feline. Bobby, a 5-week-old Chihuahua mix, was taken to the Michigan Humane Society in April after his mother was struck by a car and killed, the "Today" show reports. 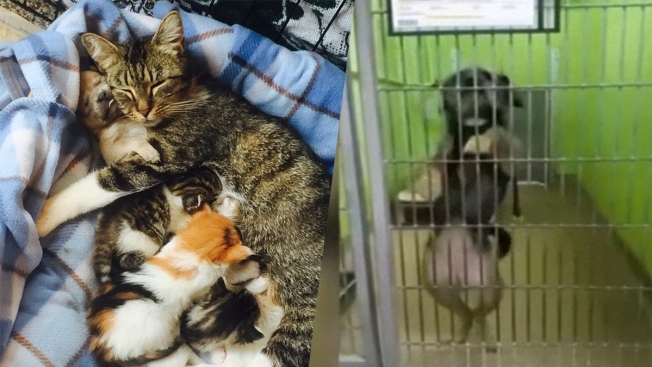 At the time, the shelter was housing a cat named Gwen who had just given birth to five kittens. Gwen had enough motherly love to go around and took in Bobby as one of her own. Eventually, the shelter will find Bobby a home with other dogs, but for now the adorable family is happy and thriving. A collegiate baseball team in Georgia took on a furry new member this spring. Daisy, a 7-week-old puppy, was found alone and crying last month outside Grayson Stadium in Savannah, according to the Savannah Bananas' team website. She had no tags or microchip and quickly found a new home with team president Jared Orton and his wife Kelsey. "It was just meant to be that we’d have a team dog as part of our staff," Orton said in a statement posted on the team website. "We took Daisy to the vet and aside from being hungry and dehydrated, she was in pretty good health." Daisy has been appointed "bat dog" and helps out in the office every day. "We aren’t sure how big she’ll get, so it’s hard to say if she’ll be able to pick up a bat or just coach first base," Orton said. "But as she grows, she’ll be a fixture at the ballpark." Two severely injured rescue dogs shared a touching moment that captured hearts nationwide. Photos of Sammie and Simon went viral when the Paws & Claws Animal Clinic posted them on Facebook. Simon, a rescued border collie, is seen comforting 3-month-old Sammie after surgery at the South Carolina clinic. Sammie arrived at the clinic from New York in early May. He had been shot in the head, dragged behind a car and sprayed with bug repellent that turned his fur blue — then left outside for three days, according to the clinic's Facebook page. Simon was rescued from another shelter where he would have been euthanized. When he got to the clinic in late April, he was emaciated, had hook worms and was "in so much pain he cried when he moved or if you touched him," the clinic wrote. According to the shelter, Sammie is healing faster than expected and Simon looks better every day. Both dogs have returned to New York to find new homes. Life hasn't always been easy for Fleetwood Mac the Chihuahua, but she fits right in with her new family. The Umbrella of Hope animal welfare organization had long tried to find a home for 8-year-old Fleetwood Mac. But a rare condition called ectrodactyly, which causes fused digits on the hands and feet, deterred potential adopters, the "Today" show reports. The organization shared Fleetwood's story on a Facebook group for people affected by ectrodactyly. It caught the eye of Victoria Campos, whose daughter Grace was born with ectrodactyly in her hands and feet, as well as a cleft palate. In early March, Fleetwood traveled from California to the Campos' home in Hobart, Indiana. The family hopes Fleetwood will help support Grace as she grows and faces the reality of living with ectrodactyly. "You don't just throw away something because it's different. We want her to learn from that," Campos told "Today." Nobody puts this puppy in a corner. Video of a 1-year-old rescue dog sashaying from side to side took social media by storm ealier this year. The footage was posted on Facebook in February by the Orange County Animal Services in Florida and captioned, "Looking for a new partner." Shared more than 250,000 times, the video features a dog fittingly named after Ginger Rogers, who starred alongside Fred Astaire in "Dirty Dancing." It looks like this Ginger has found her Fred — according to shelter workers, the pup was adopted after her dance moves won heart across the country. A dog might be man’s best friend, but who’s to say he can’t be cheetah’s best friend too? That’s what happened when Kumbali met Kago. Kumbali, a cheetah cub born at the Metro Richmond Zoo in Virginia, was the runt of his litter. When his mother wasn’t producing enough milk to feed all her cubs, zookeepers began to hand raise Kumbali. But cheetahs are meant to have companions in the wild and Kumbali was lonely — at least until he was introduced to Kago, a yellow Lab mix rescued from a kill shelter in Alabama. The two hit it off right away. Initially, they were kept in a zookeeper's home for close monitoring. Kumbali and Kago, both born in May 2015, have since moved to an outdoor enclosure and remain the best of friends. Dogs have been used as companions for cheetahs for more than three decades, providing behavioral cues and a calming influence, according to the Metro Richmond Zoo. It turns out reading really can set you free. A pit bull named Pirate is out of the shelter with a little help from his reading buddy. Pirate made headlines when he found a friend in 6-year-old Jacob, who has autism. Every Thursday, Jacob would visit the Carson Animal Shelter in Southern California and sit in front of Pirate's cage to practice his reading. "If I read to the dogs, they will come out of their cages and find homes," Jacob said in an interview with NBC Los Angeles. "They have to find new homes because they are alone." There's a happy ending to this story. Shelter workers told NBC Los Angeles in May that Pirate had left the shelter to be trained for a permanent home, and Jacob now reads at a third-grade level, according to his mother. Call them "Catman" and Robin. One South Carolina police officer has found his new sidekick in a feline friend. Officer Cody Garrett, 28, told NBC's "Today" show he adopted Squirt after a colleague found the kitten seeking shelter from the rain under a dumpster and brought him to the police department. Garrett already had two dogs at home, along with another rescue cat who had just given birth to four kittens and was still nursing. The timing was ideal. He posted a photo on Instagram of his new buddy Squirt donning a stick-on mustache that matches his own. Garrett’s picture has received more than 2,000 likes, something he says is "hard to believe." "I just wanted to show some people my new kitten, and it's kind of blown up," he told "Today."